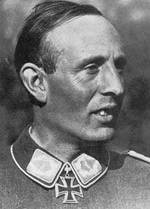 ww2dbaseFriedrich August von der Heydte was born in Munich to a noble Freiherr, a title he inherited later in life. He joined the German Army after schooling, though he soon returned to school, attending Innsbruck University to study law; he earned his law degree in 1927. Further studies in Vienna followed. He returned to Germany in the early 1930s and found himself disagreeing with Nazi philosophies. Nearly running across paths with Gestapo agents, he evaded arrest by rejoining the German Army in 1935. Between 1935 and 1937, he spent some time at The Hague, Netherlands, for further studying. ww2dbaseDuring WW2, von der Heydte famously led a diversionary mission during the Ardennes Offensive. Immediately after the battle began, both real and dummy paratroopers were dropped to falsely enlarge the appearance of the assault and to confuse Allied defenders. The operation successfully forced the Americans put up roadblocks at every road junction and checked every passer by for identification, dramatically slowing the transportation system that was so critical for the Allied war effort; British General Bernard Montgomery was stopped and checked so many times that he later asked Eisenhower for an American identification card to speed up the process. 30 Mar 1907 Friedrich von der Heydte was born.